Our product range includes a wide range of coenyme lycopene l- arginnie selenium zinc sulphate & v-e, calcium carbonate alfacalcidol soft gel capsules, rabeprazole domperidon capsule, lycopene with multivitamin and multiminerals vitamin c capsules, itraconazole capsules and omega 3 fatty acid (epa& dha) green tea extract ginkgo biloba ginseng vitamins minerals antioxidant. 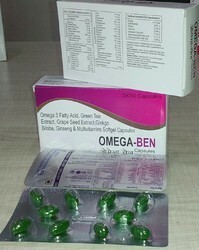 Although CoQ10(Ben-Q10) plays a key role in the body, most healthy people have enough CoQ10 naturally. There is some evidence that adding more -- in the form of CoQ10 supplements -- may be beneficial. Increasing age and some medical conditions are associated with dropping levels of CoQ10. But in these cases, it’s uncertain that adding CoQ10 will have an effect. 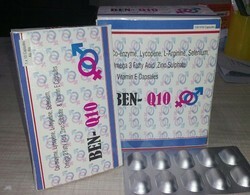 CoQ10 has been used to treat many different conditions. There's evidence that CoQ10 supplements can lower blood pressure slightly. CoQ10 is also used to treat heart failure and other heart conditions, possibly helping to improve some symptoms and lessen future cardiac risks when combined with regular medications, but the evidence is conflicting.